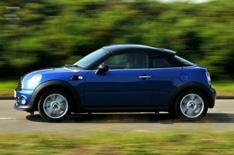 2012 Mini Coupe Cooper review | What Car? The Mini Coupe is a little different to other Mini models in that, compared with its two-seater rivals, it's actually pretty temptingly priced. This Cooper version is the cheapest of the lot. What's the 2012 Mini Coupe Cooper like to drive? Just because it's the entry-level version, don't go thinking it's slow; after all, it still wears a Cooper badge. The 121bhp 1.6-litre petrol engine delivers surprisingly handy pace if you keep the revs high, and there's enough low-down pull to keep life easy if you dont. Like most Minis, it's also great fun to fling around corners, thanks to its crisp steering, neutral balance and strong body control. Granted, the taut suspension does mean that the ride is a little on the firm side, but it manages to stay comfortable most of the time; it takes a seriously nasty surface to upset it. Where the Coupe does struggle slightly is on the motorway. The engine is a little too vocal at 70mph, and the cacophony of road noise means you really have to crank up the stereo. What's the 2012 Mini Coupe Cooper like inside? As coupes go, the Mini is actually fairly practical. Sure, it has only two seats, but there's plenty of space surrounding them and the boot is surprisingly large. In fact, the Countryman SUV is the only Mini model with a bigger boot. There's a hatch behind the seats that gives you access to the boot from the passenger compartment, too. However, the load area itself is something of an awkward shape, and the floor is uneven. It's a bit of a mixed bag in the cabin, too. As in all Minis, the driving position is spot-on, and there's lots of adjustment for your seat and steering wheel. Unfortunately, the dashboard is the usual Mini mish-mash of overly styled and poorly located switches, and rear visibility is pretty limited. The quality of the materials is also a little disappointing in places, but most of the surfaces you come into contact with most regularly feel reasonably plush and expensive. At 16,640, the Cooper is about as cheap as two-seat coupes get. Granted, superminis such as the Audi A1 and Citroen DS3 provide a lot of style for a similar amount, but neither has the glamour of a sporty two-seater sports car. The Coupe should be reasonably affordable to run, too. It returns an average of 52.3mpg, and with sleek looks and a desirable Mini badge, resale value will be extremely strong. The Coupe is cracking value, then, and although enthusiastic drivers will prefer the extra zip of the 181bhp Cooper S model, the Cooper has just as much style for 3140 less. If you care more about style than scorching performance, it's the one to buy.